Often users don’t know exactly how to spell the name of a particular product. That’s why searching tips helps them greatly in order to enter the correct search phrase and eventually find what they are looking for. To date, all of the leading online retailers in the world use search tips. This is when a user types the first few letters of a search phrase and a list of options that best fits their query drops down to a user. On average, 15% of visitors use the product search in an online store. These are the visitors who know what they want and are looking to buy. These visitors bring about half of the orders to your shop. Therefore, the sales of an online store depend on whether a website search is able to quickly find a correct good. Integrated Magento Autocomplete Extension will easily solve this task. 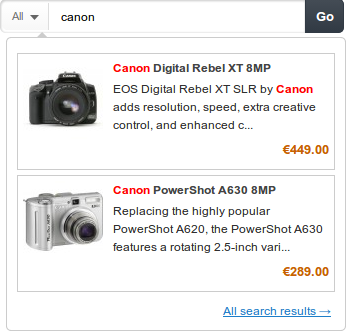 Need even better Magento Search Results? Try our extension Sphinx Search Ultimate which combined the best achievements in the field of web search! The extensions is great and add a lot of value to the magento store! Easy to integrate and great support when needed. The extension works great and it's easy to use. The speed of the searches are amazing once they are cached, wish there was some sort of cache warmer/crawler that would cache the search results based on previous entries.